Polish Pottery Butter Dish. 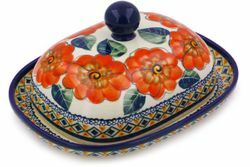 Handcrafted from durable stoneware, our Polish Pottery Butter Dish is the perfect accent to any table. The hand-painted surface is scratch resistant and easy to clean. The beautiful, high-gloss finish makes this butter dish a great presentation.